I’m a fan of expensive eyewear, but like Burnsie surmises in his Why We Can’t Have Nice Things article, the more I spend on a pair of sunglasses, the quicker I am to destroy them. 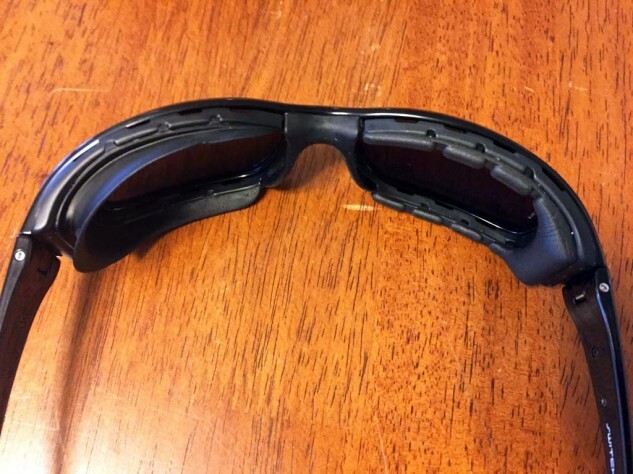 Even to complete this review I had to request a second pair of Lycans due to me losing the originals on the first overseas bike launch I attended with the sunglasses in tow. Twenty-dollar vendor-row aviators … got a box of bent and scratched ones, but it’s that I still have the low-rent shades that’s confounding. My New Year’s resolution is to have the Switch Lycans at this time next year. It’s not just the price tag (which, at $190, is certainly an investment) that’s compelling me to keep the Lycans in use, but the functionality they deliver. Using high-energy magnets, Switch devised a way to make lens swapping efficient. In a matter of a few seconds you can go from True Color Grey to Ski Yellow Low Light to match changing light conditions. The scenario is, your day begins bright and sunny then turns dark and overcast. If you continue wearing the dark sunglasses you’re putting yourself at greater risk by reducing, instead of enhancing, your vision. 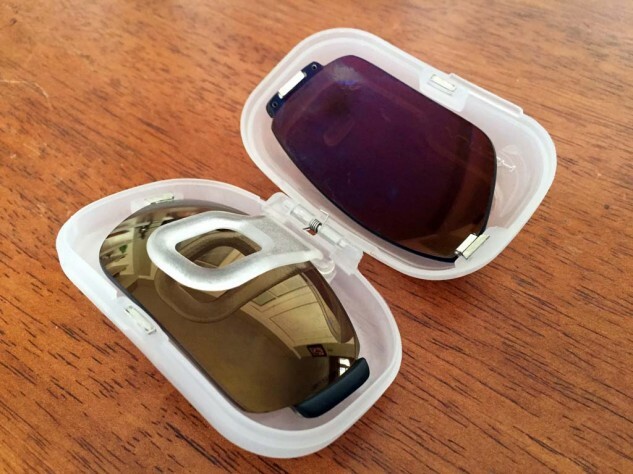 Switch lenses snap into place by way of high-energy magnets on either end of each lens. To remove, simply push on the inside left of the lens and it comes right out. Yes, the lenses will pop out of the frames when dropped from an elevation of, say, a bike’s fuel tank. This has happened numerous times to me already, and I simply pick them up, snap them back into place. The process is so quick even a whiner like me can’t find the time to complain. What’s even more amazing is that the shatterproof polycarbonate lenses have managed to remain, more or less, scratch-free. Shatterproof. I’ve considered that term before when riding with my $20 aviators inside my $700 full-face helmet. I’ll survive the accident but be blinded for life, all because I’m A) Too cheap to buy motorcycle-friendly shades with shatterproof lenses, B) Can’t keep a good pair of shatterproof sunglasses in my possession if I did buy them. The nylon frame is durable and lightweight. 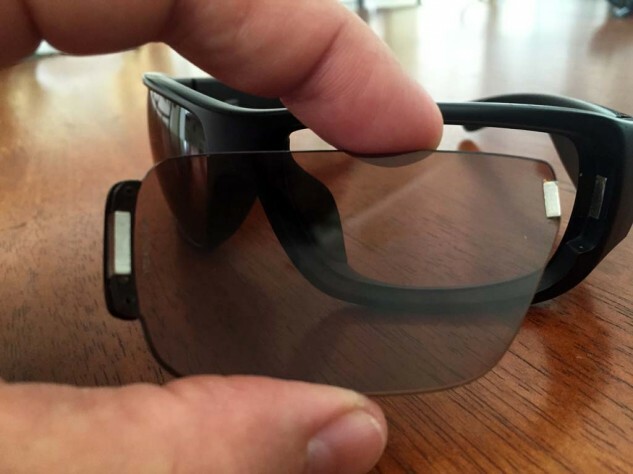 Both frame and lenses weigh in at 1.51 ounces or 42.9 grams. 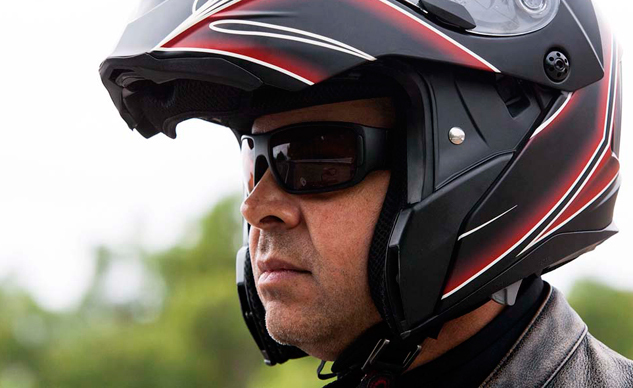 The folding arms are thin and fit over your ear and between head and helmet with no pressure points. The nosepiece is a no-slip soft rubber helping to provide both comfort and security. In addition to riding motorcycles and bicycles while wearing the Lycans, I also spent part of an afternoon jumping ocean waves on a Sea-Doo, and returned to shore with the sunglasses still in place. For $190, buyers get a Switch magnetized interchangeable frame, one pair of polarized or non-polarized lenses, a pair of Low-Light Rose Amber lenses, a microfiber cleaning pouch and a lens pod. The carrying case is a $25 option and there’s a variety of lenses from which to choose. The Lycan frame comes in the Matte Black seen here, as well as Fire Tortoise, Lagoon and Olive. There’s also a variety of other frame choices including semi-rimmed and rimless frames. Switch Stormriders with Climate Guard (left) and Activity Guard (right). Neither – at least on my head – maintain a tight seal at the outermost part of the frame. Like the lenses in the Lycans, you can swap one Guard for the other in seconds. The major problem with these types of glasses (from other manufacturers as well as Switch) is creating a good seal between your face and the frame. I have yet to find a pair that fits my face well enough to keep out sand when riding in the desert. Maybe Switch will consider getting into the moto-goggle business? Sunglasses rank among the top of the list when it comes compulsory accessories. So, if you’re in the market for a good pair of shades that’ll do more than a regular pair of sunglasses, check out the Lycans or another model from Switch at SwitchVision.com.